Otago University Rowing Club was formed in 1929 to provide students of the University of Otago the opportunity to compete against other universities in New Zealand. This remains the main aim of the club, although limited membership is now available for persons not studying at the University of Otago. The Club has a strong relationship with the Otago University Students Association for which we are indebted for it's continued support. The actual University had provided no financial support to the club until 2009 when it generously decided to support a high performance rowing program in conjunction with Rowing New Zealand. There are many students who have chosen Otago first for the Rowing Club set-up and structure and then found a course to study and it is expected this new program will add to this. We also attract many international students for this exact same reason. The club is very active throughout the year, particularly during the university term from March to November. The main focus for the club is the New Zealand University Rowing Championships held annually during the Easter break. The University Rowing Championships are open to all categories of rowers from Novice to Senior. For a full list of upcoming regattas and events see calendar. 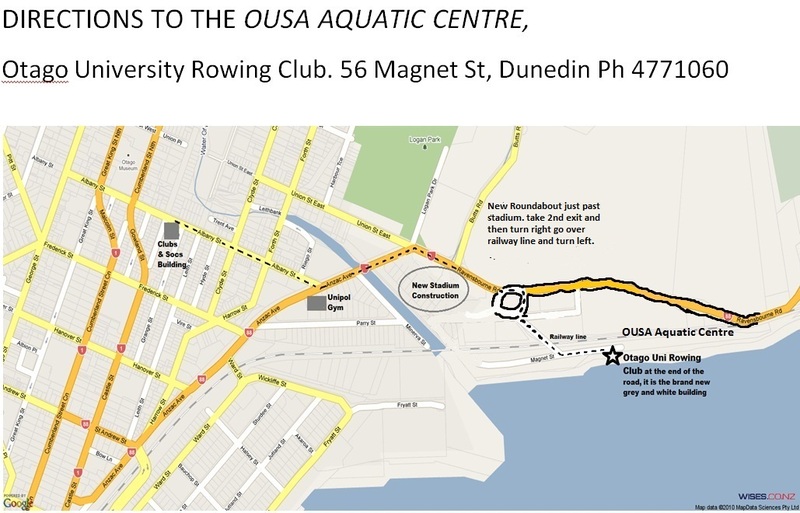 The club is housed within the Otago University Student's Association Aquatic Centre, located at the end of Magnet Street. This facility includes a large boat bay, which holds the clubs' extensive fleet of boats ranging from Eights to Singles. Most of the club's boats are KIRS and boats are well maintained and regularly replaced. The club also has a fleet of five motorised coaching boats. The club has 16 of the latest C2+Model D Ergs available for use in a dedicated erg room. This room has a full sound system and several TV's. There is also a rowing tank available to club members. There are no gym facilities in the clubhouse but the university gym is only five minutes walk from the clubhouse. Membership to Unipol is free to all students enrolled at University of Otago or Otago Polytechnic. The clubhouse also has generous changing rooms, a large function centre complete with a bar, and a kitchen available for members to use. The committee meets regularly and all club members are welcome to attend these meetings. •	BOAT Setup – All past members are required to help set up boats at the club on Saturday 25th February at 9am – New members more than welcome. •	Competing in the NZ Universities Rowing Championships is only for people who are doing a minimum of one paper at the University of Otago. You must be available to train mornings from 6am -7:30am sharp (you will make your 8am) – Mon – Thursday and Saturday from 8am – 11am - Only 5 weeks of training. And you must obviously be available to race on the 6th and 7th April at Lake Hood, Ashburton. This is not for casual/social rowers. – We will offer social rowing from May onwards. •	All athletes are encouraged to do a 2km erg race to help with their selection. •	Costs: 1st Semester Club subs $200, Subs to be paid by Saturday 10th March. This is to be paid at the Club. Money in an envelope with your name and crew written on it. Cheques to be made payable to: Otago University Rowing. You may be replaced after this date if you have not paid. Singlets $25, Rowsuits $90, Caps $20. University Rowing Champs Entry Fee $67. •	The first function will be Crate Day on Saturday the 3rd March starting at 2pm. Venue to be confirmed. Pub Crawl 17th March, Singlet Night 29th March. •	We aim to have two Novice Men’s and two Novice Women’s crews compete at the NZ Universities Rowing Championships. •	What do I wear? Long socks, polyprop top, bike pants or tight fitting shorts (not board shorts or rugby shorts), spare clothes, a hat, sunglasses, Jandals/scuffs or something similar (that you can wear into the water). •	When? You must be available to train 4 weekday mornings 6-7:30am and Saturday morning at 8am – 11am - commitment for 5 weeks will have its just rewards.